Identifier is exactly "2006-0885-F Segment 8"
This collection consists of records dealing with the attempt of the Clinton Administration to transform the health care system of the United States. The material in Segment 8 focuses on the Staff and Office Files of Arnold Epstein, Charlotte Hayes, Paul Jamieson, Kelcey Kintner, Amanda Merryman, Meeghan Prunty, and Jason Solomon. The records include reports, drafts of speeches, talking points, press releases, vmemoranda, newspaper articles, handwritten notes, statistical charts, publications, and correspondence. 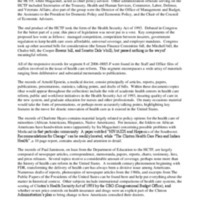 The documents highlight the history of health care, the “Health Care Express Tour,” and other proposed health care legislation.